105.7 KQAK wants to wish you, or someone you know, a very happy birthday! Let us know about upcoming birthdays and anniversaries and we’ll announce your greeting on the air during The Dave Clemens Experience. Please submit your information below no more than 30 days in advance of the date of celebration. And, make sure to listen weekday mornings at 7:20 a.m. when Dave spins The Wheel of Birthdays! 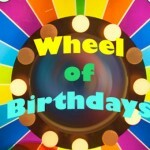 If the wheel lands on YOUR birth date, call 541-318-KQAK.